The other day I was shopping on Amazon for an egg tray (because who doesn't need an extra egg tray?) and I ran across this beauty of a deal: $9 for a WiFi enabled egg tray. A quick price comparison revealed that a current non-WiFi egg tray like I own was running $13 at Target and for $4 less and free Prime 2-day shipping? No brainer. Insta-buy. It also gives me a good excuse to buy a Wink product because they have been in the news lately. Not really sure why -- I haven't been paying attention but I'm sure it is nothing bad. A few days later the Quirky Eggminder arrived at my door step. The Eggminder packing is actually pretty nice and surprisingly easy to open compared with some technology products on the market. With a few quick swipes of a razor knife the top slides right off and you're greeted with a nice little message. No more wasted eggs indeed. The Eggminder is very well built (which I guess isn't much to ask considering the $50 price point) but I was delighted yet again by Quirky to not be holding some cheap plastic piece of junk in my hands. Each little egg tray has a sensor in the bottom and a multi-color LED next to it. There's an instruction card that tells you to download the app, and flip the power switch on the bottom. Batteries are included!!! For $9 this is such a great deal! The power switch is a little difficult to flip without using a fork or something to poke in there. Probably a good design in the long run because you wouldn't want to flip off the power accidentally and not be up to date about your egg's freshness. So far that was the most frustrating part of this setup so I guess I'm looking for things to complain about. Downloading the Wink app on iOS was pretty trivial. As usual I used the search feature of iOS to make sure it wasn't installed. Nope. Not on my phone yet. 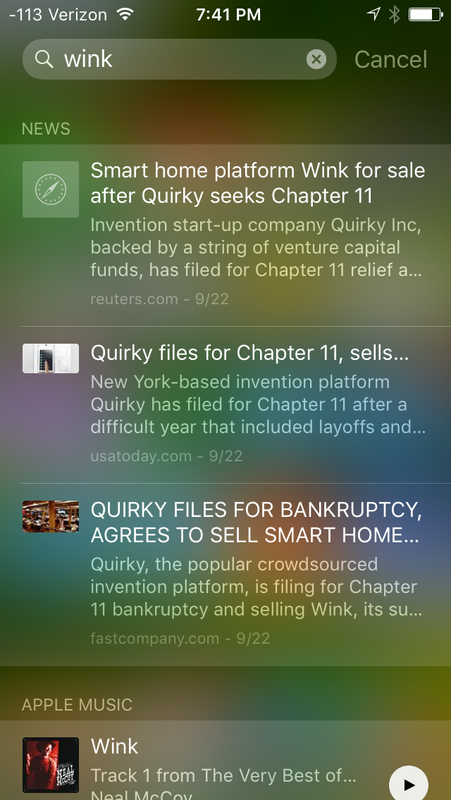 If you scroll past all this boring news and click the 'Search in App Store' button at the bottom and install. So far it's been pretty easy. The first thing the app asks you to do is add a device. 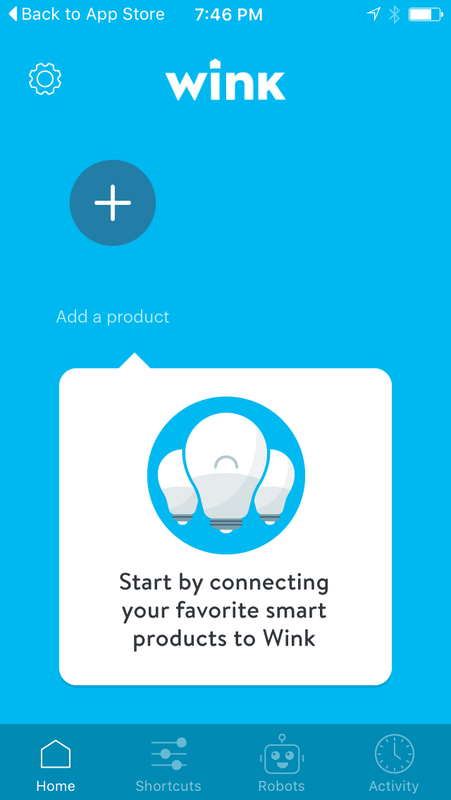 By tapping on the + button you're presented with a list of device types ranging from lights to water heaters. It's actually not that large of a list compared to the professional products I use on a daily basis but the interface was pleasant enough that I decided to poke around and see what was supported. Many of the devices required the Wink hub so maybe I'll run out to Home Depot one day and pick one up. I have a Zwave door lock that might be handy to have integrated at some point in the future and this looks like a simple enough app to use for basic control. I decided to search for egg (I'm big on search can you tell?) and the Eggminder came right up. Tapping on it brings you to a step by step instruction manual on how to get the Eggminder ready for configuration and hopping on your WiFi network. The way this works is actually quite clever since there are no visible buttons or configuration options on the Eggminder (other than the power switch mentioned above). Simply type in your WiFi network and password and follow the directions to place your phone down on the flashing orange house light. The phone emits some strobe-like flashes and the Eggminder hops online for registration and firmware updates. 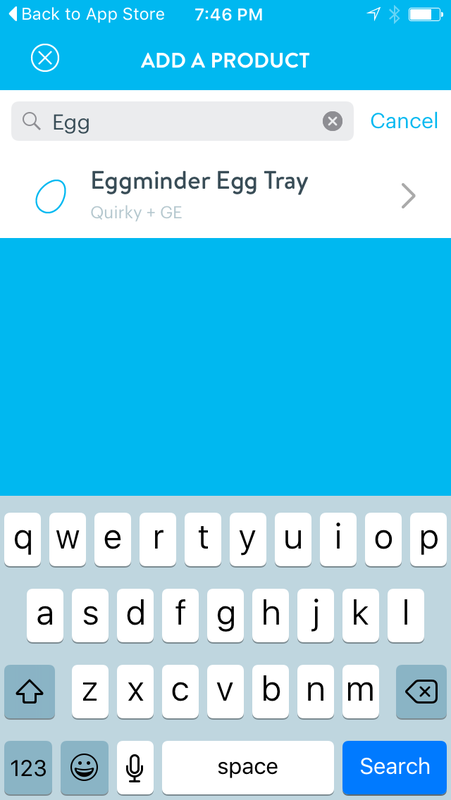 Once the Eggminder is online your phone's app shows the tray and each egg's status. There were a few questions I had going into this about how well the WiFi reception would be inside the fridge but now that I see how the tray works it makes much more sense and actually shows the genius of the product's design. WiFi is only connected when the cover is off. That means when the Eggminder is in your fridge it's not using valuable battery life to connect out to the Wink service and give updates. 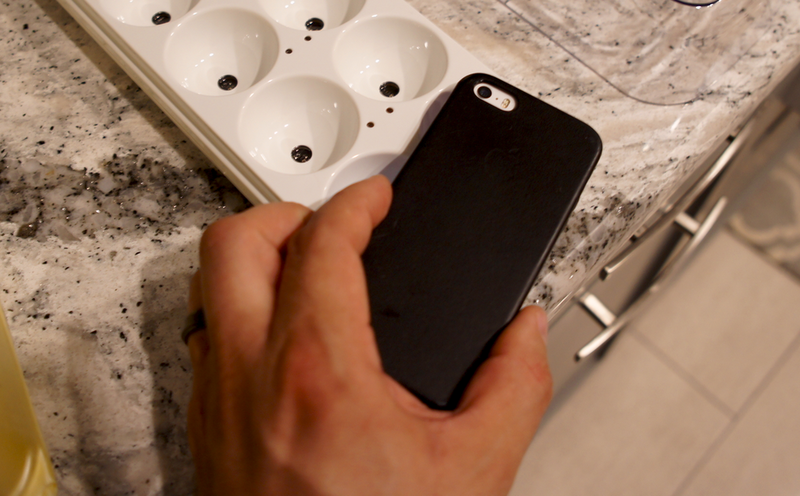 Each little egg tray has its own sensor that detects if an egg is in place. This kicks off a timer and updates the app. Now think about that. The only way to add an egg is to take off the cover -- which activates the WiFi -- which updates the service and app. Simple. This is just smart design and doesn't overthink what could be a complicated, battery draining product that doesn't work well. Once you put the cover back on the Eggminder shuts off and goes into hibernation in your fridge. I'll be testing the Eggminder over the weekend and the next few weeks to see how well it really works. I can see where some potential design flaws could be and I'm curious how well the device works around them. I'm holding off final judgment until I really see how well it works. I'm sure there will be some additional tweets on Twitter if you follow me there. For now I'm happy with my purchase. For $9 I really could not go wrong but I have to wonder why such product actually exists at a $49 price point. 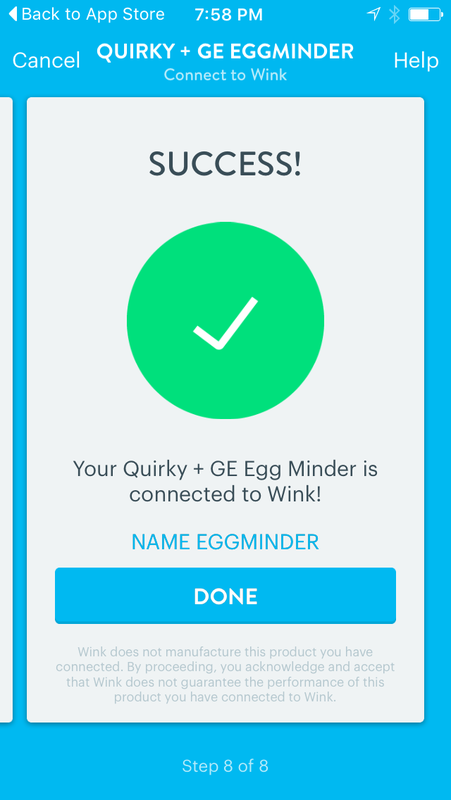 I can't imagine the "egg-tracking" market is all that large and it could explain some of the troubles we've been seeing from Wink and Quirky recently. Just because you can make something doesn't mean you actually should. The Wink app is beautiful. I really like apps like this and I really like what their design and engineering team have done. The interface and interactions are simple, fast, and put any custom product interface that I have used to shame. While I only used the egg portion of the app I can only say that from and end user standpoint the user experience of the product was both eye opening and jarring. We certainly have a long way to catch up if this is the standard DIY products are setting. I'll certainly be keeping this in mind when I look at other DIY products in the future.